Does e-photocopy leave illustrations intact or does it only convert text? Our software works as a color copier machine. The software directly copy what you see in the screen and does not transform anythings in to text. There is a link or anything to update my trial version to the paid version. Our software has a unique version. enter the code you received in the wite box and clic on button <CONFIRM THE LICENSE CODE>. If you are in the main program form you can go to the menu item "?" and select "Activate Program". Why the converted pdf pages doesn't have Good resolution? The resolution of the pdf file depends on the pc video card. 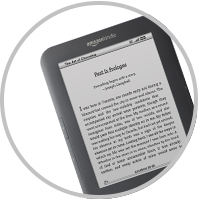 Our software makes the screen shot of each page of the ebook. Try to maximize the size of the book on video in order to take the maximum area of the video. We accept: Visa, Mastercard, American Express, JCB, Delta and Maestro and Paypal. if you have any trouble downloading the software from link received in the order email, you can do directly from our download page. Our software has a unique version . To turn the demo version in the paid version after you have installed the software run it and go to the menu item "? ", select the item register/internet and then enter the CODE you received via e-mail when you purchase the license and click on the button "click to register". I have the license code, but it does not ask for it. Every time only one page is shown and repeated. 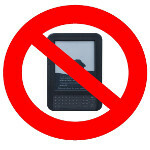 After I click "Start Copy Process", the pages of the Kindle e-book do NOT advance (it stays on the first page all the time) and the resulting pdf only has copies of that first page. 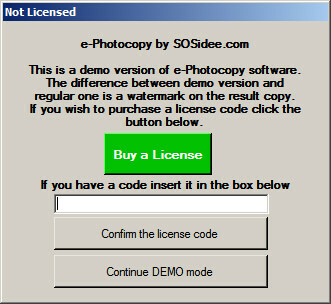 If you have a Team Viewew softtware installed (http://www.teamviewer.com/) turn off and e-Photocopy works fine.